Christian Aid Week is your chance to help some of the poorest and most disadvantaged people on the planet. In 1945, Christian Aid was set up to care for refugees left with nothing following the Second World War. Today, Christian Aid is still working with people displaced by conflict and war. Right now, over 57,000 refugees are living just in Greece alone, many in makeshift camps without even basic amenities like water. Some time this week a Christian Aid donation envelope will pop through your letterbox. Please be generous when filling it – a Christian Aid collector will be along in a few days to pick it up. Or, how about making a date for lunch? 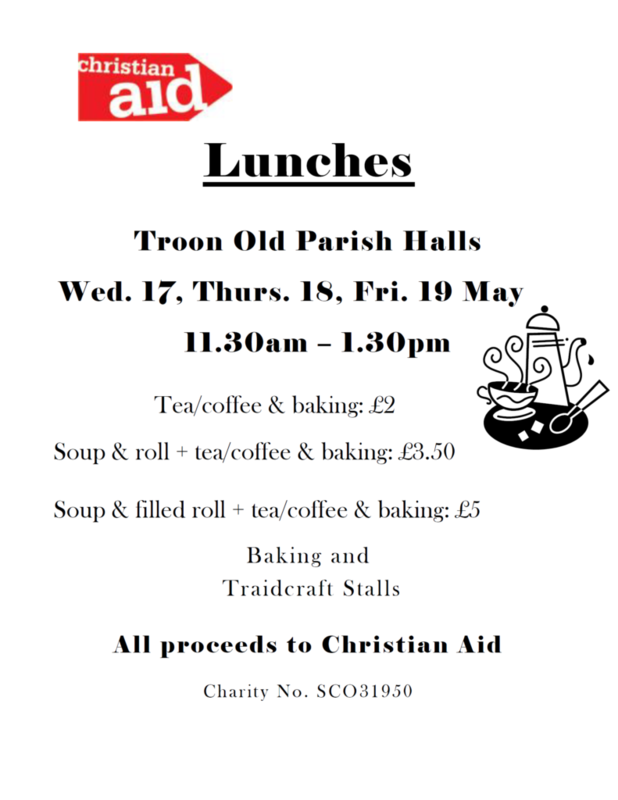 See the menu below – delicious soup and sandwiches will be available in Troon Old Church Halls on Wednesday 17th, Thursday 18th and Friday 19th May, from 11:30 am to 1:30 pm. All proceeds from these lunches go direct to Christian Aid. Finally, you could buy a Christian Aid Musical Quiz Sheet, cost just £1, available from the Church Office or during the Lunches.